The Hockley Church building in Hockley Village dates from 1887, being a Methodist Church during that period. The church building, however, had its origins as a Primitive Methodist Church built in 1869. It was located at the southwest corner of Lot 18, West Concession 7 on the east side of the 6th Line Mono Township (now Airport Road). This church was included in the Rosemont circuit. The church would have been active from 1869 to 1884 when all the different Methodist church organizations combined under a single Methodist banner, resulting in the decision to close some churches and combining others. The 6th Line church was one of those closed in 1884 and remained unused until 1887 when it was moved to Hockley Village by the combined Methodists of the Hockley area community. A witness to the moving of the Methodist church building in 1887 was a girl of 12 years, Mrs. John Beatty, who was a long time village resident. She died in 1976 at the age of 101 years. 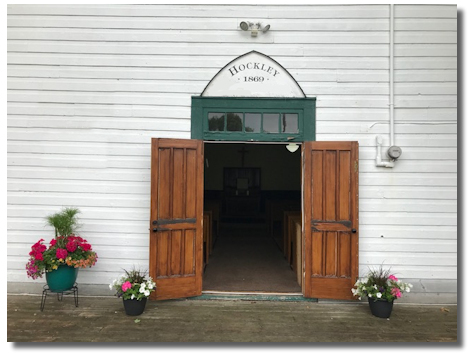 She recollected the 6th Line church being sawn into four parts in the winter of 1887, and loaded onto wooden snow sleds and pulled to the Hockley village site where the building was reassembled onto a new prepared foundation. The church held regular Sunday services until 2016. History provided by the late Jack Brooksbank. Constructed by the Hockley Loyal Orange Lodge in 1894, it was used until 1972 when the hall was deeded to the Hockley & District Senior Citizens Club in 1976. An active club in the 1970's, 1980's and early 1990's, it has continued to be used as a community gathering and meeting place ever since. Many remember regular dances being held "back in the day". The building was gifted to the community by the Hockley & District Senior Citizens Club in early 2018. 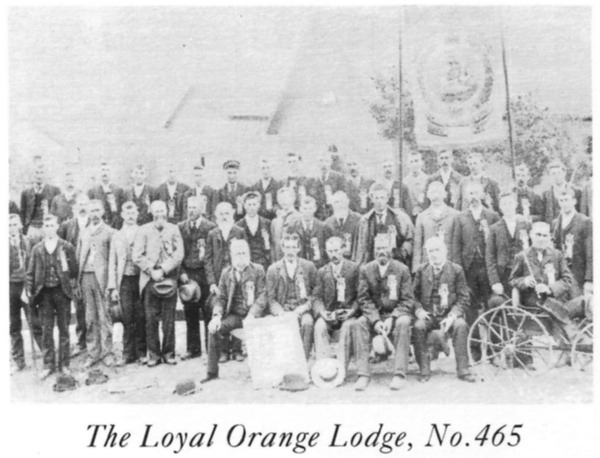 The Loyal Orange Lodge No. 465, (Hockley, Simcoe South, Mono) was incorporated in 1891. Archival records indicate that previous to this incorporation of the amalgamated areas, the original Hockley Lodge warrant was issued in 1853 to Roland Buchanan. It was situated on the Pendleton property and the meeting house was the old log stable. Excerpt from the book Adjala by McDevitt & Munnoch published in 1993.